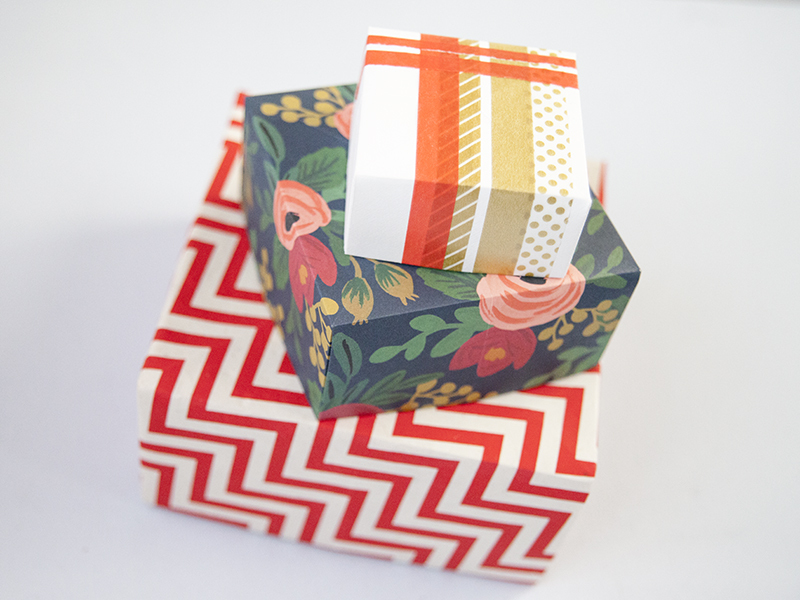 Knowing how to fold a paper gift box is an important tool to have in your crafty arsenal. Once you know how to do it, you can make one in any size you like using any paper you please. This technique is perfect for impulsive gift giving year round, and it comes in especially handy on Valentine’s Day when you need just the right box for gifting a teeny token of love or a batch of sweet treats. In the occasion that this post got your creative juices flowing, check out some of our other favorite Valentine’s Day crafts on Creativebug. To make a lidded box, you will need two pieces of paper that are perfect squares–the paper for the box bottom needs to be half an inch smaller than the paper for the box top. When folded, the box will become about one-third the size of the original square. In this example, we began with 13″ and 13.5″ squares of paper, and created a box that is 4.75″ wide and 2.5″ tall. With this in mind, feel free to experiment with paper sizes to create a custom box! A mid-weight paper works best for this project, though lighter-weight papers like plain old printer paper or orgami paper work just fine, too. As a general rule of thumb, the heavier the paper you use, the sturdier the box will be. When cutting out the paper, it’s worth taking the time to perfectly square up your right angles as that’s what will give your box a nice, uniform shape. I recommend using a clear gridded ruler, cutting mat, and rotary cutter for the job. Once your paper squares are cut out, lay the paper on your work surface with the wrong side facing up and fold the paper in half, long edge to long edge. When your corners and edges are nicely matched up, softly press the fold with your fingers, and then crease with a bone folder to make the fold permanent. Open the paper and turn it 90 degrees. Repeat to fold the opposite long edges together, pressing the fold with your fingertips and creasing with a bone folder. Next, fold one corner to the other on the opposite side. Before you use the bone folder, double-check to make sure that the crease runs right up to the corner points on either edge of the fold. Open the paper and repeat to fold the other two corners to one another, and crease the fold. With the paper opened up, fold each corner up to meet the center point where all of the creases intersect. Press the fold in place and crease with a bone folder. Repeat to fold each corner to the center. Fold the bottom edge of the square up to meet the point where all of the corners intersect in the middle. Press the fold and crease with a bone folder. Then repeat to fold the top edge down to the center. Open up the paper and turn 90 degrees. Repeat to fold the opposite long edges to the center point. Congratulations…you’re done folding! Your folded paper should look like this. Now it’s time to tuck in the edges and form the box. Open up two of the corner edges opposite each other. Once you’ve located the fold lines for the open end of the box and pressed down the tabs, lift the paper to form a third wall. And then press the paper down and over the edge of the wall. The corner point should sit right in the middle of the box. Repeat this up and over movement to create the fourth wall of the box. Once the four walls have been erected, press the interior of the box into the corners to give it a nice, crisp shape. You may want to secure the corners of the box with a little dab of glue stick on the underside, or use a piece of pretty washi tape to hold the corners in place. Congratulations, you made one half of your box! Now repeat the exact same steps on the other piece of paper. Once your top and bottom are done, fill the box with your cute handmade gift and nestle the lid on top. And if you use a pretty paper to make the box, no gift wrap is required! When first learning this technique, I recommend practicing on printer paper before diving into the fancy stuff. Once you get the technique down, this is a super fun and easy way to make a box in a pinch. Happy gifting! Thank you for sharing – I love paper crafts, and especially love tutorials about how to make something so simple unique and special. 🙂 Thanks! thanks so much for such an easy tutorial 🙂 I totally get how to make a box at last! If you draw two diagonal lines (an x) on the back of your paper to find the center point you can avoid those crease in the top & bottom of your box. Where is that gorgeous blue floral paper from!? I’ve been seeing the pattern everywhere. I couldn’t find paper with the measurments in tutorial so I cut a piece with a half inch difference. It didn’t work. Then I cut a square and it came closer. I remember making boxes like these using pages from magazines just as they came out of the magazine. Those pages are not square and I had good luck folding, then I just stopped. Is there an ideal measurment? thank you, very nice tutorial! I hope to make these at Christmastime this year! the lid needs to be a little bigger so it can fit better. Thank you so much for this! I’ve been searching for hours for a tutorial that doesn’t rely so heavily on images (I’m blind) and this is by far the best. Everytime i try this it comes out looking like a discarded piece of garbage. Oh no! It definitely takes a little practice. I’ll definately make some more of these boxes. Haha – I know that moment. Glad you pushed through it. Thank You very very much! Amazing tutorial! Beautiful Thank You so much Love it!! !